Supporting and nurturing the development of the treasury profession and professional standards across the Gulf. Launched in October 2008, ACT Treasury Network Middle East is committed to the development and sharing of treasury knowledge and expertise in the region. It provides extensive networking opportunities through events and conferences and continuous professional development through treasury training and professional qualifications, as well as recognition of treasury innovation and excellence in the region through the ACT Middle East Treasury Awards. The network is made up of over 4,500 treasury and finance professionals from a range of corporate and financial institutions from across the GCC including Aldar Properties, Rothschild, Saudi Aramco, DP World, EGA, Chalhoub Group, NBAD, Zahid Tractor and Heavy Machinery Company, Omantel, Kingdom Hotel Investments, OCTAL Petrochemicals and many more. The ACT works hand in hand with local organisations to develop national talent and proudly shares in the success of nationals passing ACT qualifications from leading organisations such as Mubadala Development Company and Etihad Airways. In recent years the ACT has been delighted to celebrate the success of hardworking and talented young nationals passing internationally recognised qualifications through the ACT Middle East student awards. Events in the GCC provide our regional network the opportunity to connect and to discuss the latest issues. Promoting best practice in treasury, our successful and well-attended thought-leadership events have featured high-profile keynote speakers such as HE Sheikha Lubna Al Qasimi. Minister of Foreign Trade of UAE and H.E Sultan Bin Nasser Al Suwaidi, Governor, Central Bank of UAE. 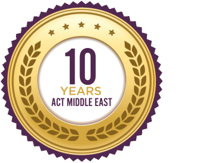 Now celebrating our 10th year of events in the region, the ACT Middle East Treasury Summit in October will unite the region’s leading corporates at the largest and most popular treasury conference in the GCC. Over 450 treasury and finance professionals attend the conference with the largest delegation attending from the UAE. For a flavour of what you can expect watch our short film.